This weekend, I finally got around to making that new salad creation I’ve been dreaming about the last few days. Ever since I received those coupons for free Fresh Express salad blends as part of the Foodbuzz Tastemaker program, all I can think about are creative salad concoctions. 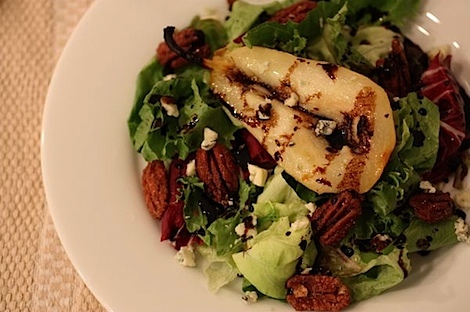 Tonight’s salad focused on a fall fruit as the star ingredient – pears! I used Bartlett because I read online they are good for roasting. 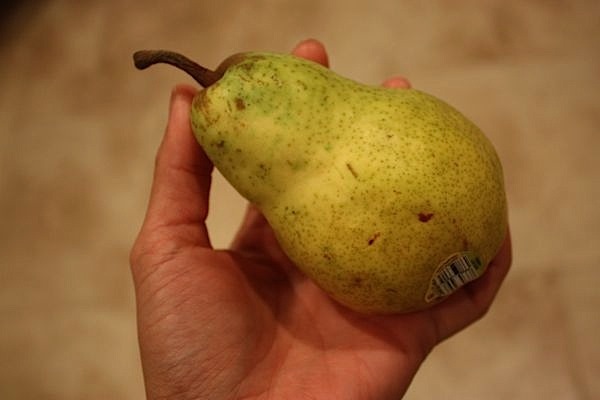 I chose a nice, firm, organic pear for my recipe. And I made some quick and easy candied pecans. These are vegan, too, because I didn’t use the traditional egg white. I actually really like my recipe because it’s easy to make in small batches. You can’t really use half an egg white (unless you use the stuff in the jugs). All in all, I’m pretty proud of my little fall salad. I had another turn feeling like a real chef with all my you-can’t-rush-this cooking: the reduction of the balsamic, the roasting of the pecans, and the roasting of the pears. It was so worth it for this yumminess! Pre-heat oven to 400 degrees F. Prepare a baking sheet with parchment paper. Cut a small slice from the bump of each pear to help it lay flat on the rounded side. Place pear wide side down and drizzle with a bit of EVOO. Bake for 10 minutes. Flip. Drizzle other side with a bit of EVOO. Bake for 10 more minutes. Remove to cool. Place salad mix on 2 large plates as your salad base. Place cooled, roasted pear on top of each salad. 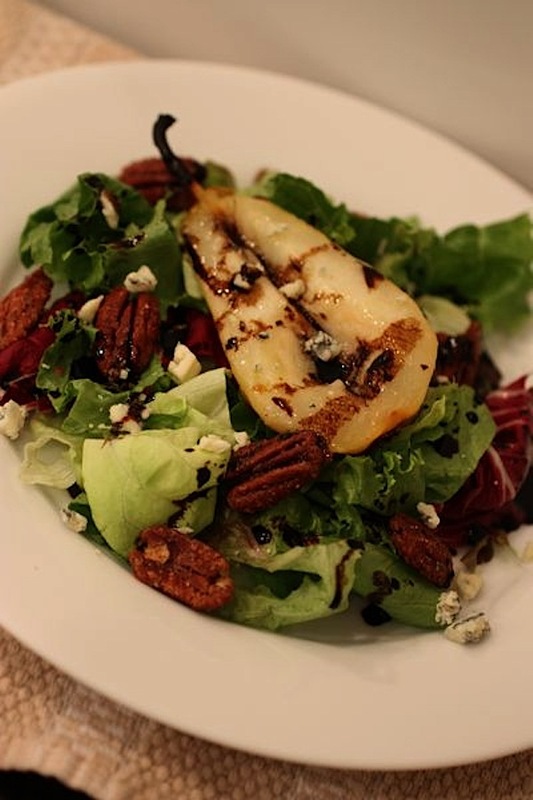 Top with gorgonzola, candied pecans, and drizzle with balsamic reduction to finish (use portions to your preferences). Enjoy! Add balsamic vinegar and salt in a small pot. Bring to a boil over medium heat, while whisking often. Reduce heat to simmer. Continue cooking, whisking often, till vinegar is to as thick a consistency as you like. (It should reduce to about 1/4 – 1/2 cup). These are great for salads, topping for bread or breakfast casseroles, over oatmeal, in cereal, over mashed sweet potatoes, or even served straight up as a party snack. Pre-heat oven to 300 degrees F. Prepare a baking sheet with parchment paper. In a medium bowl, whisk together maple syrup, cinnamon, and oil until well combined. Add pecans and stir till sauce is well-distributed and all nuts are coated. Pour nuts onto prepared baking sheet and spread out a little so nuts aren’t touching. Bake for 10 minutes. 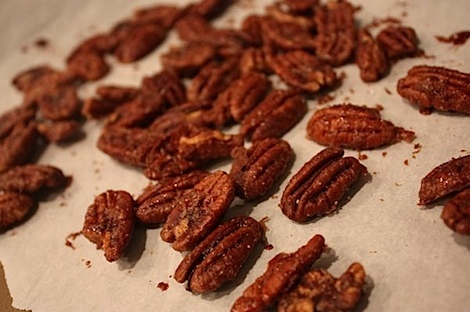 Turn pecans. Sprinkle with a bit of sugar. Return to oven and bake 10 more minutes. Remove from oven and sprinkle lightly with sugar. 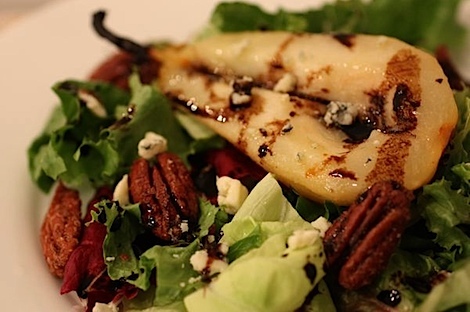 oh yummo – this salad looks like perfection on a plate! WOW! thats really quite beautiful. 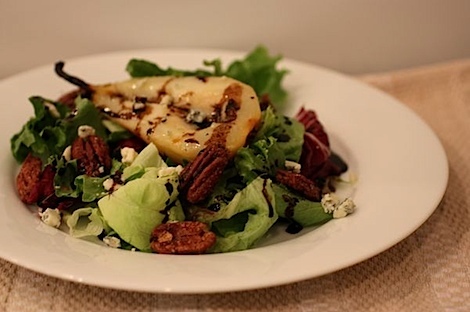 pears are feminine fruits in general, so when theyre roasted ontop of greens with candied pecans, its no wonder i feel like im in the garden of eden <3 GORGEOUS! !